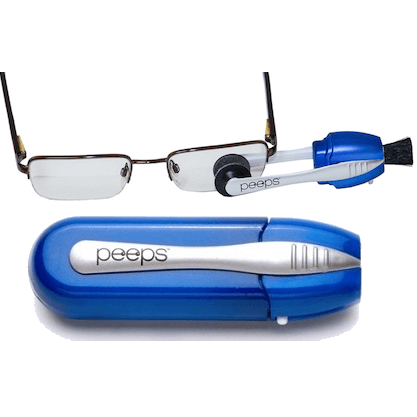 Peeps are a revolutionary new all-in-one cleaner for prescription glasses and sunglasses. Peeps contain an invisible carbon cleaning compound and are safe for all optical lenses and coatings. Peeps are good for over 500 cleans. Just place your lens between the carbon brushes and wipe. Brushes are rejuvenated when inserted back into their holder.